But if you pay keen attention to patterns, as well as the opponent’s mannerisms and tendencies, you can apply more and more pressure on your opponent’s second serve. In my own tennis life, I found it quite simple to serve against poor or defensive receivers, for there was little threat or cause for alarm. But against aggressive receivers (and in particular one Steve Cornell) it felt like i was trying to hit better first serves than I wanted to (or was capable of hitting) and then getting hammered on my second deivery. Further, players of that calibre somehow knew where I would place my second serve in big situations. They were on to my strengths and weaknesses, and with a new perspective you can learn to do the same. Jim, I just viewed this video and had this idea that I normally put into practice. In receiving the second serve I will stand inside the baseline in order to create that pressure! Be it artificial or not, it seems to put the fear factor into the serving as they know or think that I will power the return of their weak second serve. I feel it forces double faults.? What are your thoughts on that? Second serves are easily returned, so two things are of the essence: having a consistent second serve that’s difficult to return, and keeping that first serve percentage up. Sure Jim, hopefully I can find someone to feed me some balls. I am using a Dunlop 500 Tour, its weight is about the same weight as yours. I said I used a heavier racket, not a “heavy” racket, so it is relative. And my racket is head light. Some people, actually quite a few, in my club and some other clubs use 9 point something ounces rackets. Yes, I am trying to use my body as much as possible, as you taught us, ” from the center to the periphery”. I use relaxed grip and forearm for my ground strokes, especially for the forehand. And I seldom get any injury ( knock on wood ), maybe I have not hit the ball hard enough, LOL. In high school, I was taught that F = m x a, meaning force equals mass times acceleration. So for an equal amount of force you want to produce, either you increase the mass of your racket or you increase the speed ( or acceleration ) of your racket. So it comes down to how fast can you increase the speed of your racket to make up for the reduction in mass if you use a lighter racket. 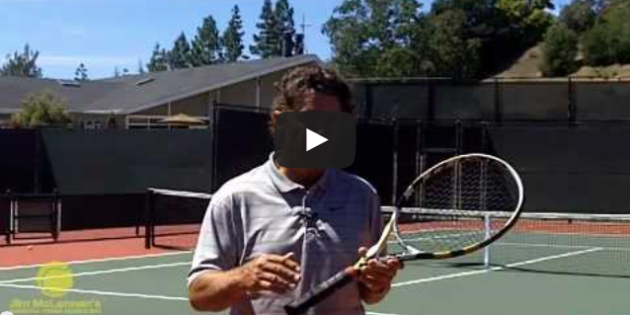 Of course nowadays, the high tech strings can give you a boost in creating ball velocity. From my observation, most of the people who use a lighter racket like to use a straight take-back and forward swing. And these people usually use only their arms to create racket speed, as a result they are prone to get arm injury. On the other hand, the people who like to use heavier rackets tend to use loop swing, in which gravity will help them to create racket speed, so the weight of a racket is not an issue for them. So if you really want to use a heavier racket, learn to use a loop swing. Then you should not have any problem, I think your age is not really the issue. On the other hand, learning a loop swing is not an easy task, speaking only from my own experience. I am still trying to improve mine and I am not going to give up. But I like using a heavier racket because you can get a better feel of the racket. And better feel equals better control. Jim, please jump in if your expertise picks up something that I said is not correct. It occured to me after watching this that I haven’t put any REAL pressure on my opponents 2nd serve in years. I used to be all over it and getting to the net. I think as I have aged that I gave that aggression up without being aware. Thanks for the heads up. Also I have been using lighter and larger sticks the last few years and can’t get used to them, is it crazy for a 61 year old to use a ‘ players racquet’. several months ago, I submitted my return of serve veideo to the HOT SEAT review at the network website. You commented that I took a full swing with my returnof serve, which was all right. but you suggested that I should tried to stay at or inside the baseline to borrow the pace of my opponent’s serve and hit it on the rise. I took your suggestion to heart and practice and practice, I am starting to get good results, I used to afraid of high bouncing 2 nd serve, but not anymore ! It is amazing that how fast the ball will go back without swinging hard, but by my opponent’s pace and my body going forward a step or two. So by combining good positioing and borrowing pace from our opponent can be a deadly weapon. Jim, I truly agree with this because if you can pressure the second serve the advantage will swing in your favor, would love for you to continue, with a little more on how to pressure the second serve for instance returning deep down the middle, when to slice the second serve vs usuing topspin also the footwork if needed to pressure the serve. They wack it..nothing tentative…..made more than missed..
Really useful – and absolutely true. I have been trying to do this, and it really works. Thank you..
As a teaching pro-slash-matchplayer I found that the best way to pressure the second serve is attacking THE SAME WAY OVER AND OVER (provided it hurts your opponent). Don’t vary. Hurt by repetition. What do I mean by that? Well, in doubles I try to return the serve back 9 out of 10 to the servicebox on the other side, obviously the side of the server, with both the first serve and the second serve. With the first serve, if the serve is very good, at least I get it crosscourt and in, even if I miss the servicebox by several metres. With the second serve, I get much more time and I will get it into the servicebox, and very often to the side of the servicebox. In my opinion, THIS shot makes the opponent feel worse about himself than anything, much more than hitting a scorching winner through he middle. Most players just don’t understand what is happening. They got a weak shot, did they not? Why can’t they take advantage of the ‘weak’ shot today? Because some shots are not weak at all. The return back in the opposing servicebox is always trouble in doubles. The partner at the net can’t reach it. As a server, If you serve and volley, you get a return at your feet. If you stay back, you have to move forward and sideways and down, which is not something human sapiens likes to do. And if he can’t, THAT’s pressure!